A Family Guide around Florida's #1 Sea Adventure park! SeaWorld Orlando doesn't do anything without talking about the ocean. As a family we've explored this brilliant ocean park over the last 12 years. If you are first time visitors...be prepared you will be impressed. 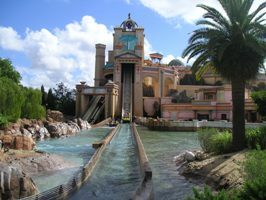 Dad has seen this park change many times over the last 27 years, with new rides, shows and much more, even he looses track at times, so we recommend this useful website which will keep you updated at all times regarding every aspect of SeaWorld Orlando. If you've found this page through your search engine brilliant, further information regarding SeaWorld is at hand, just browse our sister page offering you helpful hints and tips on general info surrounding SeaWorld. To give you a taste of what's on offer here at the park, we've put together our own personal views, tips and links, along with current up-to-date information via our RSS feed. So, make yourself comfy and join us on our adventures to SeaWorld Orlando. As with all Theme parks, Water parks etc around Orlando we always recommend an early start, especially during the high seasons. 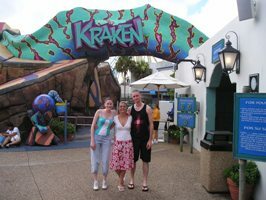 Remember all rides Kraken, Journey to Atlantis, Wild Artic and Manta are very popular, especially in the high seasons. Here's Charlotte, Leanne and Stuart first thing on a July morning, notice how quiet it is. So thrill seekers...make your way over to the rides a.s.a.p. to avoid waiting around in large queues (lines), especially now since Manta has opened with great reviews. If you have small children and the rides are not for you, what we did in the early years, was check our park map for show times around the park, and worked our day around them, starting at Wild Artic, then over to the fantastic Shamu Stadium. Wild Artic is hugely popular at SeaWorld Orlando especially after a Shamu show, so head there first to avoid large queues. Remember if you take the simulator helicopter ride join the 'Motion queue', which a 42" height restriction is in force...this ride will knock you about, back sufferers beware. If the children are under 42" join the 'Non-motion queue' which bypasses the ride to enter directly into the very cold artic land. Shamu show lasts around 35 minutes and it's now called 'One Ocean '...warning if you do not want to get wet stay away from the pre-marked splash zones...this is a fantastic show. Lots of photos and video's highly recommended. Blue Horizons - This show will spell bind all generations of families, Join a young girl named Marina as she discovers the secrets of the sea and sky in a mesmerizing blue world of adventure and wonder. Shark Encounter - Sharks swim over your head as you walk through the tunnel of terror...Only joking but you do go into a tunnel and you will be amazed at the large set of teeth every where you look...some children and adults might be scared here, very educational though. Stingray Lagoon - Great fun for the children as they get up close and touch the rays and feed them...Food is not cheap so do not get carried away if you have a large family with you...very popular in the high seasons. Clyde and Seamore's Sea Lion High....Those naughty Sea Lions are back by popular demand with an all-new sea lion comedy adventure at SeaWorld Orlando. Dolphin cove - Dolphin Nursery - After visiting here you will want to know all about Discovery Cove over the road, so you can get into the water with these beautiful creatures...Stroke and feed the dolphins while on-hand trainers are full of information regarding these bottle nose dolphins. 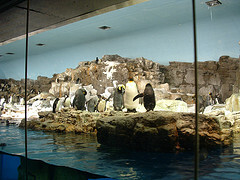 Antartica-Empire Of The Penguin - Opened spring (2013). Empire of the Penguin will get you closer than ever - and out among - its colony of penguins including gentoos, rockhoppers, adelies and kings. Your encounters with the penguins will be a first of its kind. Shamus Happy Harbour - Situated by Shamus Stadium. Shamu’s Happy Harbor is just the sort of place that proves there's never been a cooler time to be a kid. Pacific Point Preserve - Well its sea lion time again, this is a great place to visit to see sea lions nearly in their own habitat in the wild...You can feed the sea lions at designated times...See your park map for details. Manatees - Florida's version of the under water cow, and much loved through out the state. Its numbers are dropping quite fast, so here at SeaWorld Orlando you can see up close how they are trying to protect this gracious mammal in its own environment...It brings a lump to your throat. Turtle Trek - Well if you had a life of a turtle, no worries, sit in the sun all day, be fed, no bills to pay...Ha! We wish...Well this is the place to visit and ponder those thoughts...Enjoy SeaWorld's 3D 360 journey with the seas most chilled out creature! 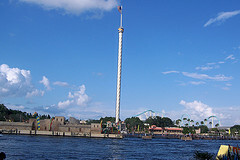 Sky Tower - For years, this tower was just a land mark for SeaWorld Orlando, but after many years closed it re-opened. For a small fee you can enjoy this six minute ride to the top and back. Make sure you have a head for heights. Great for photos and videos...You can also stop for a light refreshment at the bottom of the tower. The Waterfront - Shops, restaurants, the oyster's secret and music fill this area of SeaWorld and becomes extremely busy in high seasons so beware, lack of seats if children are tired...Seating areas are around the water front, but fill quickly when 'Reflections' starts. Jewel of the Sea Aquarium - Located at Journey to Atlantis, this amazing tropical fish aquarium lets you view a wide variety of undersea creatures... Fantastic. SeaWorld's 50th Celebration....Beginning March 21, 2014 celebrate 50 years of family fun. SeaWorld are throwing an 18 month-long celebration, and you're all invited! Aquatica Water Park....This is SeaWorld's answer to the ever popular water parks at Disney and Wet 'n' Wild. Personally we think it will out-class them all. Based on the South Sea Islands and the rugged beauty of New Zealand you better get ready to be entertained and wet!